SMITH - Wm. C. Smith, b. July 2, 1819 Rutherford Co. Tenn., d. Jan. 28, 1899. Md. Leacy Pope. Children: John W. Smith, Willis B., Sarah E., Robert H.
William Rucker, one of the early settlers of Macon county, died at his home in Oakley township Monday evening at 6 o'clock, aged 84 years. He was apparently in good health Monday, but expired suddenly after partaking heartily of supper. The deceased was a brother of the late John Rucker, and was a worthy citizen. The funeral took place at 11 o'clock Wednesday. Interment in North Fork Cemetery. Clara O. Cassell, daughter of Berry H. Cassell, died yesterday morning at a quarter past eight o’clock at the family residence on East North Street. The deceased was thirty-three years of age and for several years past has been afflicted with liver complaint, which was the cause of her death. She had only been confined to her bed for a week or so past. The last wish expressed by the deceased was that her body be cremated and for that purpose it will be taken to the crematory in Buffalo, New York. Grandma Berlin, an old resident of Decatur, is dead. Mrs. Hannah Mahannah, died near Mt. Zion, in the 90th year of her age. J. R. Mosser, editor of the Decatur Republican, has returned from a trip out West. Miss Clara Cassell, daughter of Berry H. Cassell, a wealthy citizen of Decatur, died Wednesday of liver complaint. She made a dying request that her body be cremated, and it will be taken to Buffalo N. Y., for that purpose. CLONEY - Mrs. Laura Cloney, died 1889, Nov. 8, age 34. WARD - Laura Ward, died Mar. 21, 1889, age 2 yrs. 2 mos. dau. of L. J. Ward. CUNNINGHAM - Alice Cunningham, age 18. ABRAHAM EYMAN died of la grippe, Sunday, at his home west of Decatur, aged 88. He was a native of Belleville and leaves a widow, twenty-one grandchildren and six great grandchildren. He had lived in Macon county since 1856 and had celebrated his 50th and 60th marriage anniversaries. The funeral of Pearl, infant daughter of Mr. and Mrs. Joseph Linthicum, who died Wednesday of Scarlet fever, took place yesterday afternoon from the family residence, 713 W. Marietta Street. The interment was made in Spangler Cemetery. REED - Florence Reed, d. 1892, Apr. 7, age 21 yrs. 1 da., dau. of John O. Reed. AUSTIN - William Austin, d. Mar. 5, 1892 age 86. b. Va., 1st wife was sister of Ira Warnick, 7 children, 2nd wife Sarah Woodard, 5 children. Children: Henrietta, Ben, Joseph, Wm., Lewis, Nancy, Thomas, Kate, Samuel, Mary, Wallace, James. WILLIAM E. LINTHICUM dies during the night. Friday morning Mrs. W. E. Linthicum awoke at an early hour and called to her husband to get up. Receiving no response, she took hold of him and tried to arouse him by shaking but was unsuccessful. She then learned to her horror that her husband was dead. The body was still warm and it was evident that Mr. Linthicum had been dead but a short time. Mr. Linthicum was troubled by heart disease. He was 54 years old. A native of New Hampshire, but for the past 38 years had been a resident of Macon County. He leaves a widow and eight children. J. S., A. J. Linthicum and Mrs. R. A. Grub of Decatur; L. E. Linthicum of Niantia; R. A., L. J., M. C. and Charles of Harristown. The dead body found in the Sangamon river Thursday evening proved to be that of Charles Chandler, foreman in the Wabash Truck department. Coroner Bendure went to the river east of Sangamon station early yesterday morning and held the inquest there. The men who found the body testified that they first saw a man's hat, and a little farther up the river the body of a man without any coat. The tied the body to a tree, where it stayed until the coroner arrived there yesterday morning. The pants pockets were filled with rocks. Thursday afternoon Chandler was seen for the last time walking across the bridge. Their verdict of the jury was that the deceased had come to his death by drowning. 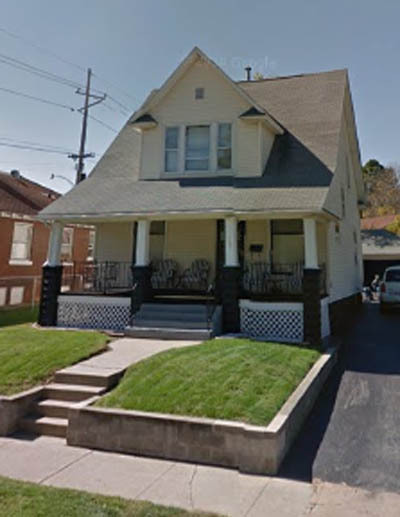 Chandler was 34 years old and single and lived with his parents, Mr. and Mrs. Alfred Chandler at 404 East Bradford street. He commenced Sunday to take the drink cure. Thursday forenoon he was at the shop as usual and apparently in as good spirits as usual. In the afternoon he passed the office window a little after 1 o'clock and as the clerks glanced out he made a gesture of the hand which they interpreted to mean that he had been getting another injection. He left the shop between 3 and 4 o'clock without speaking to any one, a thing which he was not accustomed to do. There was nothing in his conduct to occasion alarm in the minds of his associates. His mother received the following letter dated Nov. 17 through the post office yesterday morning. "Dear Mother - I can stand it no longer. I tried as hard as I could to give it up. Give my love to all. Draw my money and do the best you can with it. Its been a hard struggle to give it up. I take the coward's way. You will find my body near the Wabash bridge east of town. Your poor unfortunate son, Charlie Chandler"
The body was brought to Decatur but this time for the funeral has not yet been arranged. The father of the young man is in Chicago and was expected here last night. COX - George E. Cox, died age 26 yrs. 1893. ADAIR - Edith Adair, d. Dec. 17, 1893. SHACKLEFORD - Mrs. Mary J. Shackleford, d. Aug. 25, 1893 age 44 - Salem Cemetery. MITCHELL - John Mitchell, d. 1893 age 22 yrs. ARMSTRONG - J. T. Armstrong, d. Tolono 1893, leaves 2 sons Charles and Benjamin. ODOR - Perry Ordor, died 1893, son of J. N. & Maggie Ordor. COLE - Mrs. Jennie Cole, wife of Geo. W. Cole, d. 1894 - 5 children. McDANIEL - Wm. McDaniel, died Jan. 24, 1894 about 8 yrs. of age. EVANS - Mrs. Thomas Evans, died May 20, 1894 age 71. Burial at Salem Cemetery. 11 children - 8 living: Mrs. Lizzie Evans, Ms. Dolph Williams, J. H. Evans, Mrs. Mathews, Wm. Evans, Mrs. C. Tooley, Mrs. G. Henely, Mrs. G. Ford. b. Feb. 15, 1823 Muskingum, Ohio. Md. Thomas Evans in 1841. 4 brothers: John, Henry, Abe, Tom and Mrs. Johns. RANDOLPH - Rev. F. S. Randolph, d. Plainsfield, N. J., Jan. 18, 1815, d. 1896. Md. first in N. J. (? ); md. 2nd Sarah E. Odor near Decatur, Ill.; md. 3rd Elizabeth Neff in Mattoon, Ill. BOWMAN - John Bowman, 1896(97? ), dau?. of Frank Perdue. BRADY - Maude Brady, age 8, d. Sep. 12, 1897, step-dau. of E. S. Ray. EVANS - Eliz. A., age 67?, d. 1897, wife of Wm. Evans. SEIPER - Richard Seiper, d. 1897 age 40 - Salem Cemetery - wife and 5 children. WILLIAMS - Adolph Williams, died Jan. 31, 1897 age 55. Burial Salem Cemetery. KENT - Kent, Infant 3 yrs. died 1898, son of R. Kent. PHILLIPS - Madison D. Phillips, b. Garrard Co., Ky. May (or Mar.) 16, 1835; d. age 62 yrs. 10 mos., Md. Sarah C. Elder July 18, 1855; 7 children. BUNDY - Jessie Bundy, d. Oct. 28, 1899 age 16, dau. of Solomon Bundy. GODETT - Lourin Godett, wife of John Godett, died 1899 age 39. Leaves husband and 3 children: Mary, John, Maude. BURT - Nellie Marie Burt, died 1900 Aug. 12, age 2 yrs. 8 mos. dau. of M. S. Burt. THORNELL - (John) Thomas Thornell, died 1900 age 22. BELL - Rev. William Carrol Bell, b. Green Co., Whitehall, Ill., Sep. 14, 1828, youngest of 10 children. Md. Aug.. 23 1853 Sarah A. Doss of Bowling Green, Ky. Rev. Bell d. Mar. 6, 1900. EVANS - J. C. Evans, died Aug. 30, 1900 age 24. T.B. Albert, died at his home on Cassell Hill at 10:30 last night aged 84 years. The deceased had been a sufferer from Brights disease for the past ten years his advanced age along with the disease was the cause of his death. With the death of “Uncle Tommy” Albert, as he was familiarly known, is the passing of one of the citizens of the city who was for many years a familiar figure in the legal circles of the city. The deceased was born in Dauphin county, Pa., in 1816 and moved to this state when 20 years of age, settling with his parents in Putnam county. After twenty years residence in that county he came to Decatur and has since made his home here. He was elected to the office of justice of the peace and for eighteen successive years held that office. Eleven years ago,then an old man, he retires from the office and since that time had lived a retired life making his home with his brother-in-law, Berry Cassell, on Cassell’s Hill. The deceased was a member of Celestial lodge No. 65, I.O.O.F. and that organization will have charge of the preparations for the funeral, the time to be announced later. Mr. Albert is survived by a wife and two daughters, Mrs. H.M. Obendorfer and Miss Sallie Albert, both residing at Milwaukee. He is survived by nine grandchildren and one brother, Jacob Albert of Long Creek township. He Had Lived in Decatur Since 1865 Michael L. Cassell, a veteran of the civil war and an old resident of Decatur, died at 4:30 PM, Sunday, November 11, at the home of his daughter, Mrs. Della Roberts, 307 North Franklin street, aged 76 years. paralysis was the cause of death. For nine years Mr. Cassell had been in poor health on account of a stroke of paralysis and last Tuesday, he suffered another stroke which proved fatal. Michael Cassell was born in Harrisburg, Pa, and later lived in Iowa. he came to Decatur in 1865 and has resided in the city ever since. He was veteran of the Civil war having served as a member of Company K, Fourth Iowa volunteers. Mr. Cassell leaves five children, all of whom were here at the time of his death excepting Charles Cassell, who lives in Missouri. The others are Mrs. Ira Meizenhelter, Mrs. Della Roberts, Mrs. C. W. Ray and Mrs. Ida Lobaugh. Mrs. Cassell died four years ago. Four brothers survive. They are Berry H. Cassell of Decatur, Henry and Gus Cassell of Putnam County and Squire John Cassell of Niantic. Mr. Cassell was a member of the United Brethren church and was devoted in his Christian faith. He was also a member of Dunham post, No 141, G. A. R. The funeral will be held Tuesday. There will be services at the house at 2:30 o’clock and at the Untied Brethren church at 3 o’clock. Rev. M. B. Spayd will officiate and the burial will be at Greenwood cemetery. LEDBETTER - Flora Ledbetter, 10 mo. old 1901, dau. of James Ledbetter. LEBO - Charles Lebo, d. Jan. 23, 1903 age 31, s/o Mr. & Mrs. Peter Lebo. Mrs. Louisa Ann Cassell, wife of Berry H. Cassell, died last night at 8:10 o’clock at the home of her son, T. A. Cassell, 905 East Main street. Mrs. Cassell was 80 years old. She was one of the oldest settlers in this county. She was born in Hagerstown, Md., her maiden name being Louisa Ann Sholtz, and came west to Springfield about 1830, where she lived for four years and then came to Decatur, where she has since lived. For the past nine years she has made her home with her son, T. A. Cassell. Mrs. Cassell leaves two sons, Hilton Cassell and T. A. Cassell and five grandsons, Louis B., Fred R., Otto B., Berry H,. Jr., Gren and one grand-daughter, Ray. Mrs. Cassell was a sister of Mrs. J. L. Peake who died about two years ago. For the past two years Mrs. Cassell has been an invalid, having been afflicted with gangrene and dropsy. Berry H. Cassell died at 4 o’clock on Wednesday morning at Cassell’s Castle at the head of South Webster street. He was in the eighty-third year of his age. The immediate cause of his death was gangrene of the left foot, which set in last Friday, though he had been in failing health for years. He had been blind for the past twelve years and his decline has been steady. Since last spring he had failed rapidly. He did not suffer much pain until last Friday, when gangrene set in, but from that time on he suffered greatly. In spite of his blindness and his physical decline. Mr. Cassell's mind remained perfectly clear and bright and he loved to converse with friends who called to see him. Up to within a few hours of his death he was able to talk with those about him, and even when no longer able to talk he recognized those at his bedside. A singular circumstance connected with his death is that his wife, Louisa Ann Cassell, died a year ago this month, and her death was caused by gangrene which affected the same foot. Mr. Cassell owned extensive property interests in and near Decatur. Two years ago, on his birthday anniversary, he gave considerable property to his children, and again when he was 82 years old he gave them some property. Besides the home place on which Cassell’s Castle is situated, which contains 14 acres right in the residence district on the city, he has a farm of 400 acres, a short distance northeast of the city. He owned the building on East Main street, where Dan Higgins saloon is located. He was a member of Macon lodge No. 8, A. F. and A.M. and also a Beaumanoir commandery, No. 9, Knights Templars and was always prominent in the order until his health began to fail. He is survived by two sons, B. Hilton Cassell and Thomas A. Cassell and the following grandchildren: L. B. Cassell, F. R. Cassell, O. D. Cassell, Berry H. Cassell, Ward Cassell and Miss Ray Cassell. He was a man of culture and refinement and was held in high esteem by all who knew him. The funeral which will be in charge of the Masonic fraternity, will be held from the residence at 3 o’clock Friday afternoon. The interment will be at Greenwood. Decatur, Oct. 12. - Special- Berry H. Cassell, aged 32 years, died here today. Mr. Cassell owned extensive property interests in and near Decatur and was prominently identified with the early history of the city. He was noted for his wonderful memory of dates and events. Niantic, Ill., Oct. 18. - Mr. and Mrs. John Cassell returned home from Decatur where they were called by the death of Mr. Cassell's brother, Berry Cassell. Bride of Seven Weeks Dead. She had been married to her husband but a little over seven weeks. Her husband, Otto Cassell, recently received notification that he was one of the heirs to the Berry Cassell estate - property valued at over $500,000. Mrs. Cassell was very popular in local social circles and her recent marriage was one of the most brilliant weddings of the year. She was 19 years old. Decatur, Nov. 5. - Special- The funeral of Mrs. Julia Norman was held at 10 o'clock this morning from the residence of her daughter, Miss Bertha Norman, 246 East Bradford street. The services were conducted by Dr. W. H. Penhallegon, pastor of the First Presbyterian church. There was a large attendance of friends, and there were many beautiful floral tributes. On July 15, 1905, Henry Cassel passed to the other shore, at his home in Florid, age 79 years, 4 months and 14 days. Deceased was born in Dauphin County, Pennsylvania back in 1826 and came to Putnam County in 1840 at the age of 14 years. On September 18, 1847, he was united in marriage to Miss Sarah Bashore. To this union, two children were born, Katy E. and Charles W. , both of whom died in early childhood. In 1854, he and his wife moved to Decatur, Macon County, Illinois, where they resided until February 1899, when they returned to Putnam County and again took up their residence in Florid. Mr. and Mrs. Cassell united with the M. E. Church 22 years ago under the ministrations of a noted evangelist and have been true and faithful Christians ever since. Henry Cassell was an honest and industrious man and accumulated considerable property during his life-time. He was quite the unassuming man, strictly honest with his dealing with his fellow man. The funeral took place Monday afternoon, conducted by Reverend A. R. Jones , Pastor of Hennepin, M. E. Church. Internment in Florida cemetery. BUNDY - Infant Child of Mr. & Mrs. Frank Bundy d. Mar. 3, 1906 - Salem Cemetery. WILSON - Henry R. Wilson, d. Sept. 6 1909 age 64 - Burial Salem Cemetery. Md. Martha Josephine Wilson; 3 children: Herbert Wilson, Mrs. L. E. Theobold, Mrs. Walter T. Lord. MORRIS - Thomas J. Morris, died Nov. 10, 1900 age 55. WILSON - Miss Mary Wilson, d. Sat. Jan. 1, 1910 age 62, dau. of Dr. & Mrs. Geo. A. Wilson. Leaves 3 sisters and 1 brother. Mrs. Robert Reed died at her home three and one half miles southeast of Oreana April 13, 1911, aged 54 years and eight months. She had been a sufferer from cancer for the past 2 years and for the last three months had been confined to her bed. Through all her sufferings she was kind and patient and always thoughtful of those who cared for her. Barbara Fulk was born in Green County, Indiana August 13, 1856. She came to Macon County with her parents when she was quite young and has spent the remainder of her life in this vicinity. She married Robert Reed April 19,1875 and to them were born 14 children all of who are living. They are Albert F. and Mark T. of Decatur, John W., Mrs. Fannie Bullock and Ralph H. of Oreana, Lee A., and Mrs. Nellie Stuart of Oakley and Lester, Homer, Byron, Melvin, May and Fern who reside at home. Besides the children and husband she leaves one brother, John Fulk of Oakley, 16 grandchildren and a host of friends to mourn her loss. She was a noble wife and unusually kind and loving mother and an excellent neighbor. The funeral services were held at the Oreana Christian Church Sunday morning at 11 o'clock conducted by Rev. F. E. Galigern, pastor of the Oreana Christian Church. The music was furnished by a double quartet composed of Mrs. E E Conley, Misses Grace Kirby and Ida Strope, Mrs. J C Spooner, Misses Ira Thompson, Kenneth Cooper, J C Spooner and J. H. Moothart. The honorary pall-bearers were O. L. Stuart, D. Turpin, J. Stuart, H. Hirsch, D. Seitz and H. C. Bower. The active pall-bearers were J. H. Burgess, T. Pensinger, J. P. Dilling, N Larson, J W Duvall and M Boyer. The flowers were in charge of Mrs. C. Betzer and Mrs. E Thurman. The floral tributes were many and beautiful. Interment was in the Union Cemetery. Oreana, April 15-- Mrs. Robert Reed died at her home 3 1/2 miles south-east of Oreana Thursday afternoon. Death was caused by cancer from which she had been a sufferer for the past two years and had been confined to her bed for the last three months. Louisa Barbara Fulk was born in Indiana, August 13, 1856 and was married to Robert Reed April 19,1875, in Decatur, Illinois. Mrs Reed was the mother of fourteen children, all living and all present at the funeral. She leaves a husband and the fourteen children who are: Albert and Mark Reed of Decatur, Roy Reed of Casner, Lee Reed and Mrs. Frank Stuart of Oakley, John Reed, Ralph Reed and Mrs. Guy Bullock living near Oreana and Byron, Melvin, May and Fern all at home. She also leaves one brother near Oakley. The funeral services will be at the Union Church Sunday morning at 10 o'clock, conducted by the Rev F. E Gallgar of the Christian Church. Interment will be in Union Cemetery. Russell W. Hill died Saturday morning at the residence of his parents, Mr. and Mrs. Martin J. Hill, 349 East Herkimer street. He had been ill for a week. His age was five years and two months. Besides his parents he leaves a sister, Martha Hill. The funeral will be held at 10:30 Tuesday morning at the First Christian church. The interment will be in Long Point cemetery, south of Niantic. MRS OTTO CASSELL died at 5 o’clock on Friday afternoon at her home on Cassell Hill. Her death was caused by typhoid fever after an illness of nine weeks. She was twenty-four years old. She was born in Logan county, Jan. 11, 1888. She is survived by her husband and two small children, Harold, aged two years, and Everett, aged four months. She is also survived by her father, W. H. Leimbach, and two brothers, W. H. Leimbach, JR., and Hubert E. Leimbach, all of Latham. She was a member of the Lutheran church in Mt. Pulaski. A short service will be held at Cassell’s hill at 7:45 a.m. The funeral party will go to Mt. Pulaski at the 9:05 train and the funeral services will be held at Mt. Pulaski. Interment will be in the Mt. Pulaski cemetery. MRS. SUSAN STARR of 823 North Broadway died at 6:30 Friday evening at St. Mary's hospital. She had been ill for four months. her death was caused by Bright's disease. She was forty years old. She was born in Effingham July 23, 1872, coming with her parents to Decatur in 1882. She is survived by her mother, Mrs. A. C. James, three sisters, Mrs. William Leighton of Chicago, Mrs. F. W. Dempsey of Des Moinses, Ia., and Mrs. Flo Merkle of Springfield, and one brother, H. C. James of Decatur. The body was removed to Moran's undertaking establishment and prepared for burial. The funeral of Mrs. Starr will be held at 4 o'clock Sunday afternoon at Moran's chapel. The internment will be in Greenwood. The death of Mrs. Fannie W. Cassell, wife of B. Hilton Cassell, which occurred at 3:15 Friday afternoon at the family residence on Cassell hill, was the second death in the family within a week. Her daughter-in-law, Mrs. Otto Cassell, having died in the same house just a week ago Friday, and her funeral was held last Sunday. Mrs. Fannie W. Cassell was taken ill the day before the death of her daughter-in-law. The latter’s death was caused by typhoid fever, while that of Mrs. Fannie W. Cassell was caused by heart trouble. Mrs. Cassell was sixty-nine years old. She was born in Ross county, O., Oct. 17, 1843. She was married to B. Hilton Cassell in 1872. The family home has been in Decatur for many years. She was a member of the First Methodist Church and of the Order of the Eastern Star. Besides her husband, she is survived by three sons, Louis B. Cassell, Fred R. Cassell, and Otto D. Cassell, all of Decatur. She also leaves two brothers and three sisters, Joseph Harrison of Muskogee, Okla., Matthew M. Harrison of Decatur, Mrs. Sarah Wilt of Warrensburg, Mrs. Mary Lintner of Chitwood, Mo., and Mrs. Eliza Mount of Decatur. The funeral will be held at 2 o’clock Sunday afternoon at the family residence on Cassell Hill. The interment will be in Greenwood. Conducted Shoe Shop Here Forty Years. E C Linthicum who for about forty years or more conducted a shoe shop in Decatur died at 6 o'clock Thursday- morning at the residence of his nephew, A J. Linthicum, 513 East William Street. He would have been eighty-three years on Oct. 25. His death was due more to infirmities incident to old age than to any specific ailment. He had been in feeble health for the past two years and of late had been failing rapidly. Mr. Linthicum was born in Hamsher County West Virginia. Oct. 15, 1831. He came to Decatur in 1854 and had lived here ever since. He was a shoemaker by trade and for thirty-five years he conducted a shoe shop in the 600 block of East Wood Street. Later he moved to the 300 block East Main Street, and had his shop there for seven years. He had been unable to work for over two years. He was a member of the First Christian church and was known to all of the older residents of Decatur. His wife died last November. He is survived by one son, J. P. Linthicum of Decatur, and two daughters Mrs. John Smither? of Jersey county, Illinois, and Mrs. I. V. Ford of Council Bluffs, LA. The body was removed to the Brintlinger undertaking establishment and prepared for burial. MOONEY - Funeral services for Frank J. Mooney of Decatur, son of the late Peter Mooney of this city, who died Sunday afternoon, were held at 9 o'clock yesterday morning in Decatur, Interment was made in Calvary cemetery at Decatur. The Knights of Columbus were in charge of the burial. Funeral Services for Mrs. Catherine Chandler will be conducted at 2 o'clock this afternoon in the Church of God. Burial will be in Greenwood Cem. Claude E. Morton 79, of 2252 East Hickory in Decatur, Il., died at 10:45 pm Friday in Americana Nursing Center in Decatur. Funeral Services will be 10:30 am Monday in Dawson Wikoff Funeral Home in Decatur where friends may call after 4 pm Sunday. Burial will be in Graceland Cemetery on North Oakland In Decatur, Il. Mr. Morton was born in Ohlman, Il. the son of Thomas and Eunice Morton. He has lived in Decatur for 41 years. He is a retired employee of Christy-Foltz Construction Co. He was a member of the Christian Church at Harvel, Il. He belonged to the Laborers Local Union 159. He married Grace Kelley on December 29, 1919 in Indianapolis, In. Mr. Morton leaves his wife, son Victor R. of Ottowa, Il. and two brothers Chester and Carl both of Pana. He had two grandchildren. A sister preceeded him in death. .....Before Mr. Albert went to the infirmary about a year ago he made his home with a niece Mrs. Charles Bobb, 281 E. Leafland St. He was also the uncle of Mrs. Maude Ware and Elmer Chandler of Decatur. He was born near Harrisburg PA over 80 years ago. The funeral will be held Sunday afternoon at the Brintlinger & Sons chapel. The interment will be in Greenland. B. Hilton, one of Decatur’s most prominent citizens and real estate men, died at 3 o’clock Sunday afternoon at the residence of his son, Louis B. Cassell, 224 Park Place. He would have been seventy-four years old in March. His death was caused by cancer, with which he had suffered for a long time. His condition had been serious since last Spring. At that time he was operated on at the Decatur and Macon County hospital, but only temporary relief was gained. Since then he had been able to go downtown at rare intervals and since the first of September, he had been confined to his bed. Mr. Cassell was born in Decatur March 30, 1848 and had lived in or near Decatur all his life. His father, Berry H. Cassell, was a native of East Hanover, Pa., and his mother, formerly Miss Louise M. Schultz was a native of Maryland. They came to Decatur when it was but a small village. Berry H. Cassell had a tin shop in a long building that occupied the site of the present Linn & Scruggs store. The family lived in the rooms at the rear of the building and there B. Hilton Cassell was born. He attended the public schools and after finishing his schooling engaged in various forms of occupation until his marriage in 1872 to Miss Fannie W. Harrison of Ohio. Then they moved to a farm in Decatur township and remained there until 1901. For the last eighteen years Mr. Cassell had lived in Decatur. His wife died in 1912. He is survived by three sons, Louis B. Cassell, 224 Park Place; Fred R. Cassell, 1430 West Decatur Street and Otto D. Cassell, 125 South Hilton Street. He also leaves one brother, T.A. Cassell, 1066 West Main Street. Mr. Cassell was prominent in real estate circles, in which business he was engaged for many years, and he assisted materially in the substantial growth of the city. Mr. Cassell was prominent in Masonic circles, being a thirty-second degree mason. He was a member of Macon Lodge No. 8A.F. and A.M., Macon chapter No. 21, R. A. M., Decatur council No. 16, R. and S. M., Beaumanoir commandery No., 9, Knights Templar, Peoria consistory, Decatur chapter No. 21, O. E. She was always interested in every movement that was for the best interests of Decatur and was held in high regard by all who knew him. The body was removed to the Dawson & Wikoof undertaking establishment and prepared for burial. The funeral will be held at 8:30 o’clock Tuesday afternoon in the residence of his son, 224 park Place. The interment will be in Greenwood. William J. Hamilton, veteran of the Civil war and for many years an employee at the Wabash shops, died early Monday morning at the Soldier's home in Quincy. He was seventy-nine years old. He had been in feeble health for some time. Mr. Hamilton was known to most of the old residents of Decatur. He had lived here since the close of the Civil war and during most of that time was employed at the Wabash shops. He had many friends here. He was a member of Dunham post, 141 G. A. R. He is survived by three children, Attorney Fred Hamilton of Decatur, and Miss Cora Hamilton and Mrs. Stella Mallory, both of Phoenix, Ariz. The body was brought to the Moran undertaking establishment Monday to await arrangements for the funeral. Mrs. Martha Ann Fletcher, wife of Teron W. Fletcher, died at 5:30 o'clock Sunday afternoon in the family residence, 1088 South Franklin street. She was forty-six years old last January. Her death was caused by a complication of diseases with which she had suffered since Nov. 22. Mrs. Fletcher's maiden name was Martha A. Barlett. She was born in Christian county Jan 29, 1873. She had lived in Decatur for twenty-six years and was one of the best known and best liked woman in the southeast part of the city. For the last eighteen years she had resided in the house where her death occurred. She was a member of Grace Methodist church, and also of Golden Crown Camp, Royal Neighbors of America and of the Daughters of Pocahontas. She was greatly interested in church work and in lodge work, and she was a friend in anyone in need. She was never too busy to help out in cases of illness in the neighborhood and she was never appealed to in vain. Mrs. Fletcher is survived by her husband and two children, Perry and Luella Fletcher. There are two grandchildren. She is also survived by her parents, Mr. and Mrs. Joseph Barlett, and three brothers, C. M Barlett of Decatur, J. A. Barlett of Mt. Auburn and J. E. Bartlett of Florida. The body was removed to the Moran undertaking establishment and prepared for burial. The funeral of Louis Joubert was held at 10 o'clock Saturday morning at the residence of his daughter, Mrs. Charles Mccormick, 1042 West Decatur Street. The services were conducted by Rev. Elisha Safford, pastor of Westminster Presbyterian church. There was a large attendance, members of Dunham post, 141, G. A. R., being present in a body and conducting their ritualistic exercises. The music was furnished by Mrs. Corydon C. Nicholson and Mrs. Homer Bateman. The active pallbearers were J. B. Stocks, Roy Phillips, Samuel Phillips, C. E. Hildreth, W. Linhurst and T. J. Wright. Charles S. Leonard, formerly of Decatur, died at 5 o’clock Wednesday afternoon at his home in Washington, D.C. He was a brother of Mrs. Charles Cassell. His boyhood days were spent in Decatur and he will be remembered by many of the old residents. Mrs. Margaret Eley died at 11:25 O'clock Saturday forenoon at the residence of her daughter, Mrs. Jeannette Demlo, 439 East Grand Avenue. She was 80 years old last July. She had been in failing health since last April. Three weeks ago, she suffered a stroke of Paralysis and her condition had been critical since then. Mrs. Eley was born in Kentucky July 4, 1841. Most of her life was spent in Peculiar, Mo. She came to Decatur, May 27, 1921, to make her home with her daughter. Her husband William Eley, died several years ago. She was a member of the First Methodist Church. Mrs. Eley is survived by the following children: Mrs. Emma Sands of Mackinaw, IL. Mrs. Parthenia Britton, Mrs. Hattie Smith and Presley Eley, all of Peculiar, Mo., Mrs. Katie Mohr of Melvin, IL., Mrs. Jeanette Demlo of Decatur, Mrs. Mattie Wilcox of Sand Springs, Mo., and John Eley of Canada. There are twenty-eight grandchildren, and eighteen great grandchildren. The body was removed to The Moran & Sons Undertaking Establishment and prepared for burial and later taken to the residence, 439 East Grand Ave., where friends may call from 8 to 9 this morning. At 10 O'clock the body will be taken to Peculiar, Mo., and the funeral will be held there Tuesday afternoon. Mrs. Anna Rainey Cloud, wife of Elmer Cloud, died at their home, five miles northeast of Cisco, Tuesday morning at 11:15. She had been suffering from Bright's disease for two years. The funeral will be held at the Presbyterian church in Cisco Thursday morning at 10:20, Rev. H.D. Trickey of Argenia officiating. Internment will be in the Croninger cemetery. Besides her husband, Mrs. Cloud leaves one daughter, Mrs. Eva McCartney, and one son, Earl Clouf of Clasco, two sisters, Mrs. Wilson of Hume and Mrs. Mary Parr of Decatur and four brothers, James Rainey of Easterville, Ia, Cleve Rainey of Champaign, William Rainey of Cerro Gordo and Elmer Rainey of Cisco. Thomas Albert Cassell died unexpectedly at 6 o’clock Wednesday morning at the family residence, 1064 West main street. he would have been sixty-six years old in June. His death was caused by liver and stomach trouble. Mr. Cassell was born in the St. Nicholas hotel June 30, 1856. He had lived in Decatur all his life and was engaged in the real estate business. He was widely known and had many friends. Few of his many acquaintances had any idea that he was as old as he really was. he did not have a gray hair in his head and was as spry and active as a man of forty, which he appeared to be. Mr. Cassell was a member of Macon lodge no. 8 A. F. and A. M. and Macon chapter no. 21, R. A. M. He was also a member of Decatur lodge, B. P. O. Elks. He is survived by his wife and three children - Mrs. R. L. Moore, Berry H. Cassell, Jr. and Ward Cassell, all of Decatur. He was a cousin of Charles Cassell of Decatur and Major Frank Cassell of Chicago. He was a son of Berry H. Cassell, who built the mansion on Cassell’s hill, that was destroyed by fir in 1915, and who died in 1904. The body was removed to the Monson & Wilcox undertaking establishment and prepared for burial. The funeral will be held at 8 o’clock Friday afternoon at the residence, 1064 West main street, and will be under the auspices of Macon lodge no. 8, A.F. & A.M. The interment will be in Greenwood cemetery. William Chandler dies in Colorado. William Chandler, former resident of Decatur, died Tuesday night in Boulder Co. His death was unexpected, his relatives in this city having no intimation that he was in ill health. William Chandler was 67 years of age. He was born in Decatur and until he went to Colorado about 12 years ago had passed all of his life in this city. He was a candy maker by trade and was employed as such by Wood Bros. when they conducted a confectionery establishment many years ago and after that employment was engaged in other establishments. He leaves his wife, Mrs. Bell Chandler and daughter, Mrs. Irene Denison of Denver; his sisters Mrs. Maude Ware, Mrs. Esther Sheets, Mrs. Charles Bolt of Decatur and Mrs. Frank Graham of St. Louis; his brothers, Elmer and Lou Chandler of Decatur. Mr. and Mrs. Elmer Chandler have gone to Boulder to attend the funeral. Louis Grant Chandler age fifty-seven died at his home in Oakley township Monday night at 7 o'clock. Mr. Chandler was born in Decatur and had lived his entire life in and around Decatur. Death was due to dropsy. Mr. Chandler leaves his wife, a stepson, Fred Richardson, one brother Elmer at Decatur and four sisters, Mrs. Esther Sheets, Mrs. Maude Ware and Mrs. Charles Bobb, all of Decatur, and Mrs. Frank Graham, St. Louis. Mr. Chandler was a Spanish-American War veteran, having served in Co. H. Fifth Volunteers, during the Spanish-American war. Funeral services will be held at the home of his brother Elmer at 421 East Leafland street, Decatur, Thursday morning at 10 o'clock. Burial will be in Greenwood cemetery. Mrs. Lydia Ann Bryant died at the home of her daughter, Mrs. Marshall Garrett, 879 South Stone Street, at 2:50 o'clock Sunday afternoon. A week ago Saturday she slipped and fell down cellar steps, fracturing her skull. She never regained consciousness after the fall. Lydia Anna Palmer was born in Ohio Oct. 24, 1845, and her husband, John Wesley Bryant, preceded her in death 12 years ago. She leaves five children W. G. Bryant, Rushville, Mrs. Marshall Garrett, Decatur, Mrs. Sarah Potter, Decatur, Mrs. Laura Mullmax, Decatur; and John L. Bryant, Springfield. She also leaves two sisters, Mrs. Elizabeth Perryman, Cowden; and Amelia Kyle, Ashland, O. She is also survived by Walter Montooth, of Shelbyville, whom she raised from childhood, and 11 grandchildren and 10 great-grandchildren. She was a member of the United Brethren church of Parkersburg. The body was removed to J. J. Moran & Sons funeral home and prepared for burial. Funeral services will be conducted in the Moran chapel at 3 o'clock Monday afternoon by Rev. Matthew Mueller. The body will be taken to Parkersburg early Tuesday morning. Friends may call at the Moran undertaking establishment until the hour of the funeral. Edwin C. Moore, 71, died at his rooming place, 312 W. King street at 1:30 P.M. Wednesday afternoon, following an illness of two weeks. He came to Decatur about two years ago from California where he lived several years. He was at one time a resident of Decatur. He has no relatives here but leaves one sister, Miss Ellen Moore, in California. Orville Monroe Mills, 1446 North Church street, died in St. Mary’s hospital at 1 o’clock Thursday morning following an operation. He was born in Pana, Sept. 2, 1907. He leaves his wife, Jessie, and his father of West Wood street, Decatur. The body was removed from the Moran & Son funeral home to Pana Thursday afternoon. Funeral services will be in Pana Sunday. Eliza A. Trueblood, wife of Lane Trueblood, 2653 E. North Street, died in St. John's hospital in Springfield at 3:55 o'clock Thursday afternoon. She had been confined in the hospital for the last 11 days. Mrs. Trueblood was born Sept. 10, 1874 in Assumption. She leaves beside her husband, her mother, Mrs. Ella Mitchell, four children by a former marriage, Mrs. Orlando Bell, Decatur; Mrs. Lawrence Ooten, Decatur; Fred M. Patton, Petersburg; Arthur E. Patton, St. Louis, Mo. She also leaves two sisters and three brothers. The body will be brought to the Dawson & Wikoff funeral home Friday morning. Funeral arrangements will be made later. TAYLOR, Violet; Service in Moran's chapel this afternoon at 2 o'clock. Mrs. Levina J. Hursh, 77, widow of Daniel W., died in her home at 335 West William street, at 7:35 o'clock Friday night. Her death was attributed to old age and a complication of diseases. Mrs. Hursh was born in Newville, Pa., March 12, 1852. She married Daniel W. Hursh on May 26, 1870 in Newville. The couple moved to a farm near Warrensburg in 1880 and had lived there until Mr. Hursh's death. Mrs. Hursh came to Decatur 10 years ago. She leaves the following children: Eva Hursh, Detroit; Mrs. Harvey Stearns, Peoria; Mrs. Earl Dagget, San Bernadino, Cal. ; Mrs. C. E. Kruzan, Rensellar, Ind. ; Mrs. Arthur Cressler, and Mrs. J. H. Bunker, Decatur; Charles W. Hursh, Warrensburg and J. E. Hursh, Lovington. She also leaves the following brothers and sisters: C. C. Getter, Pottstown, Pa.; Dr. J. P. Getter, Bellville, Pa.; Elmer Getter, Newville, Pa.; Mrs. Dora Rice, Philadelphia; Mrs. Myra Moore, Westminster, Md. ; and Mrs. Rose Berlan, Harrisburg, Pa. She also leave 15 grandchildren and five great grandchildren. The body was removed to the Dawson & Wikoff funeral home and will be returned to the home sometime Saturday afternoon. Abraham J. Linthicum, 70 years, a resident of Macon County, died of heart disease at 2:30 o'clock Saturday afternoon in St Mary's hospital, where he had been a patient since last Friday. A. J. Linthicum, son of William E. and Harriet Linthicum, was born March 28, 1860 near Harristown. During the last 14 years he had been a resident of Decatur, conducting a billiard hall in 253 West Main Street. His first wife, who was Alice Butzien, died in 1908; in 1918 he was married to Mrs. Mary Linthicum. He leaves his wife and three step-children: Elmer Linthicum and Mrs. Bertha Lee of Decatur and Mrs. Josie Smith of Lincoln; Also his brothers, M. C Linthicum and C. C. Linthicum of Decatur; his sisters, Mrs. Rachel Grubbs and Mrs. Rosanna Robinson of Decatur, Mrs. Jennie Clum of Harristown and Mrs. Lou Lebo of Forsyth. The body was taken to the under-taking room of J J. Moran & Sons. William Francis Naftel, 1095 West Arrow highway, Upland resident for the last 35 years died last night at an Ontario rest home following a two years' illness at the age of 67 years. A native of Macon county, Illinois, Mr. Naftel came to Upland from Crowley, La. Widely known as a citrus rancher he served for many years as a member of the board of directors of the Upland Citrus association, much of the time in the capacity of vice president. He was also a director of the Mountain View Water company. A member of the Upland Methodist church, he served as superintendent of its Sunday School for 20 years without missing a session except when in the hospital or attending a church conference. Surviving Mr. Naftel are his widow, his mother, Mrs. W. J. Naftel, Pomona; two daughters, Mrs. Marion Grothe, Upland and Mrs. Glenn McLaughlin, Ontario; three sons, Earl Naftel, Detroit, Mich.; Eldon and Robert Naftel of Upland, the last named now being stationed with the army in Maryland; three sisters, Mrs. N. H. Garrison, Ontario; Mrs. A. Tauner, Sacramento; and Mrs. V. Teska, Pomona; two brothers, Charles Naftel, Santa Monica and Harry Naftel, Covina, and eight grandchildren. Funeral services for Mr. Naftel will be conducted Wednesday, 2:30 p.m.,. at the Upland Methodist church, with the Stone mortuary in charge. The remains will be entombed at Bellevue Mausoleum. Mrs. Maude B Ware, 75, of 1815 E. Prairie Ave, a lifelong resident of Decatur, died last midnight in St. Mary's hospital. She had been in failing health three years. Mrs. Ware was born in Decatur Oct 20, 1871. She married Howard Ware in 1897. He died in 1910. She was a member of the East Park Baptist church. She leaves three daughters, Mrs. Glen Pilcher, Mrs J. W. Davis and Mrs. Arthur Gallivan, all of Decatur; two step-sons, Walter Ware of Decatur and Dr. Harry Ware of Clarksburg, Ohio; two sisters, Mrs. Charles Bobb of San Diego, Calif., and Mrs. Frank Graham of Decatur; four grandchildren and three step-grandchildren. Funeral services will be in the Moran & Sons funeral home at 2 p.m. Monday. Burial will be in Boiling Springs cemetery. Friends may call at the funeral home after 7 p.m. today. Mrs. Berdella Stevens, Ill Since 1944, Dies January 12, 1951 Mrs. Berdella Stevens, 72, 1135 East Curtis Avenue, died at 10:30 am today in Decatur and Macon County hospital. Ill since 1944, she had been hospitalized for nine months. Born in Fayette county April 20, 1878, the daughter of Ira and Phoebe German, she was married to James O. Stevens in 1899 near Brownstown. They came here to live from Macon in 1920. She was a member of the Brownstown Christian church. Mrs. Stevens leaves her husband; a daughter, Mrs. Evelyn Shively, Decatur; a son, Mervil C. Clinton; two brothers, Russell German, Brownstown, and O. C.
German, Tovey; and two grandchildren. The body is in the J. J. Moran & Sons funeral home, where friends may call after 7 pm Saturday. Funeral services will be at 1:30 pm Monday in the funeral home with burial in Graceland Cemetery. Walter Herbert Ireland; b. 12-16-1909 - d. 11-2-1954, 6:15am. born; Moweagual, Ill, m/w divorced. Occupation State Patrol Judge-Racing Assn. Em: W. Virginia Horse Racing Assn. Place of death - Decatur, Macon Co., Ill. - Buried Fairlawn Cem. Lot 720-3 Section L. - Parents John W. & Lillie Edith Ireland. Children 1st Lt. John Ireland, Jr., Europe, no other info, Mrs. Charlotte Ann Maunsell, Salem Depot, NH. ; Mrs. Mildred (Dawson-Ray) Ireland, Montebello, Calif. - Sister,; Charles Edward Ireland - Montebello, Calif. - Brother. Mrs. Jeanette Demlo Roberts, 92, a Decatur resident for 49 years, died at 3:30 a.m. yesterday in Wakefield's Nursing Home, 1504 North Water St.
She is survived by eight children, four step children, a brother, 22 grandchildren, 42 great grandchildren, and one great-great grandchild. Mrs. Roberts came to Decatur 49 years ago from from Bondville. She was a charter member of First Nazarene Church of Decatur. She was born in Hannibal, Missouri December 2, 1862 a daughter of William and Margaret (Skates) Ely. She was married to William Demlo who preceded her in death. She later was married to Alva Roberts. He also preceeded her in death. Surviving are five daughters; Mrs. Ethyle Phillips, Canada, Mrs. Lillian Robb, and Mrs. Mary Shanks, of Decatur, Mrs. Jeanette Burns, Mt. Auburn, and Mrs. Mabel Burns of Germany; three sons, Herbert T. Demlo, Decatur, and Clarence and Clifford Demlo, addresses unknown; three step daughters; Mrs. Mabel Buckles, Springfield, Mrs. Marie Wallace, Decatur, and Mrs. Lydia Sullivan, Indiana, and a step-son, George Roberts, Missouri. She also leaves a brother, Presley Eley, Odessa, Missouri. Born: 14 May 1907 in Mount Zion, Macon County, IL. Died: 21 Jan 1972 in Decatur, Macon County, IL. Mrs. Russell (Mildred Fern Shobe) Kelley 80 of Decatur, Il. died 11:44 am Sunday September 6, 1987 in St. Mary's Hospital in Decatur, Il. Burial was in Macon County Memorial Park, Harristown, Il. with memorials to the heart fund. Mrs. Kelley was born in Lovington, Il. daughter of Owen & Laura (Gould) Shobe. Mrs. Kelley was a member of Central Christian Church. She worked for Linn & Scruggs Dept. Store for 17 years. She married Russell Kelley in 1936. Survivors include her husband; son Ronald Kelley of New York, NY. ; sister Mrs. Dorothy Young of Bradenton, Fl. Her parents and two brothers preceded her in death. Mrs. Cecil (C. Leta "Peggy" Walker) 88 of Mattoon, Il. formerly of Decatur, Il., died 11:38 pm Monday December 11, 1989 in Odd Fellows Home, Mattoon. Burial was in Graceland Cemetery on North Oakland in Decatur, IL. Mrs. Kelley was born in Assumption, Il. daughter of Charles W. & Emma L. (Farthing) Walker. She was a member of the First Baptist Church of Decatur, Starlight Rebekah Lodge #767 and the Past Noble Grand Club. She married Cecil D. Kelley in 1926. Survivors include; her husband; one nephew and four nieces. Three brothers and one sister preceded her in death. Doris Maxine Buckley Schilling 79 of Decatur died at 5:50 am Friday (April 3, 1998) in St. Mary's Hospital. Graveside services will be 2:30 pm Saturday in Graceland Cemetery (buried in the veterans section alongside of her husband Frederick Guy Schilling) on North Oakland in Decatur, Macon County, Illinois. There will be no visitation. J. J. Morans & sons Funeral Home is in charge of the arrangements. Mrs. Schilling was born may 28, 1918 in Decatur the daughter of Arthur & Alma (Stevens) Buckley. She had worked as a sub station postal clerk. She married Frederick Guy Schilling on January 12, 1937. He preceeded her in death in May 1, 1957. Surviving are her sons, Frederick Guy Schilling Jr. and wife Sheila; Ronald W. Schilling and wife Mary, and Larry Schilling both of St.Paul, Minn.; brother Bill Buckley & wife Betty of Florida; sisters Rose Ellrick & husband Walt, Delores Knotts & Husband Jess, and Elaine Brozio & husband Don, all of Decatur; grandchildren, Theresa Krueger, Fred Schilling III, Anna Wexler, Jim Schilling, Tom Schilling, Susan Schilling, Ronald W. Schilling Jr., Rhonda Schilling, Dawn Avery, Todd Schilling & Chad Schilling. She was preceeded in death by her parents, husband, brothers, Art, Henry, & Therman and sister, Helen Curtis. Lucille Markham "Aunt Lucy" age 70 passed away at Villa Franciscan on Tuesday, October 20, 1998. Previously living in Decatur, IL. Retiree of Illinois Bell after 35 years of service. Preceeded in death by her parents and one brother. Survived by her sister Pauline VanNatta and brother William Schilling. Also numerous nieces and nephews. Graveside services will be held at 11:00 a.m. on Saturday October 24, 1998 at Woodlawn Memorial Park. Memorial Contributions to the Joliet Area Community Hospice would be appreciated. Arrangements by: Grant-Tapella-Freitag Westwood Memorial Chapel on Jefferson St. at Essington Rd. Pete M. Kelley 65 of 2316 E. North St. died 6:20 pm Thursday in St. Mary's hospital. Funeral services will be 10 am Monday in J. J. Moran & Sons Funeral Home with Visitation 4 to 9 pm Sunday. Burial will be in Graceland Cemetery on North Oakland In Decatur, Il. Mr. Kelley was born in Hardensburg, Ind. son of Alpha & Prudence (Blevins) Kelley. He retired from A. E. Staley Mfg. in 1973 after 37 years, was an Army veteran of World War II and was a member of Moose Lodge 684. He married Kathryn G. Ooton in 1941. Surviving are his wife; sons, James E. Sapp, Donald W. Sapp both of Decatur; daughters Mrs. Raymond (Margaret) Deardorff and Mrs. Jerry (Patricia) Underwood, both of Mt. Zion, Il. ; brothers, Cecil D., Russell E., and Paul E. all of Decatur; sisters, Mrs. Claude (Grace)) Morton, Mrs. Glen (Gertrude) Stewart, Mrs. Wayne (Helen) Babcock, all of Decatur; 15 grandchildren; 3 great grandchildren. Kelley, Kathryn G. 89 of Decatur died 2:20 am Saturday, June 3, 2000 in Imboden Creek Living Center. Burial was in Graceland Cemetery in Decatur, Illinois. Memorials to: Imboden Creek Activity Fund or Donor's Choice. Mrs. Kelley was born Feb. 12, 1911 in Vandalia, Il., daughter of William & Mary (Smith) Ooton. She was a member of St. John's Lutheran Church in Vandalia, retired after working for 20 years at Houdaille Hershey and 18 years as manager for Elmer's Tavern. She married James E. Sapp Sr. in 1926; he preceded her in death. She married Pete Mahlon Kelley in 1941; he preceded her in death. Survivor's include: son Donald Sapp and wife Joan of Oreana; daughters Margaret Deardorff of Decatur, Il., Patricia Underwood and husband Jerry of Mt. Zion, Il. ; 15 grandchildren; 25 great grandchildren; three great great grandchildren; brothers Dean Ooton of Argenta, Il., Carl Ooton and wife Sue of Decatur, Il. ; sisters, Grace Heinen and husband Phil of Decatur, Il., Charlotte Downs of Decatur, Il., several nephews and nieces. Her parents, three sons, one daughter, three brothers, and four sisters preceded her in death. Lelah A. Buckley 90, of Decatur, died 4:25 pm Friday June 30, 2000 in Decatur Memorial Hospital. Burial was in Macon County Memorial Park Cemetery. Mrs. Buckley was born in Stewardson, daughter of Stephen and Melissa Beals. She operated a boarding house for elderly women and was a member of People Church of God. She married Henry S. Buckley in 1926. He preceeded her in death in 1981. Survivors include: sons, Jerry Buckley and wife Marge, Charles E. Buckley and wife Elizabeth, Richard Buckley, Jack Buckley and wife Pat all of Decatur, Glen J. Buckley and wife Kaye of Springfield, Mass; daughters Vivian Marie Best and husband Richard of Auburn, Wash., Vera Christianson and husband Chris of Federal Way, Wash.; 20 Grandchildren; 26 Great Grandchildren; six Great - Great Grandchildren; brother Clifford Beals and wife Helen of Decatur; one half brother; three half sisters; many nieces and nephews. Her Parents, one son, one grandchild, five brothers and two sisters preceded her in death. DECATUR -- Roy Edward Gallagher, 81, of Knoxville, Tenn., longtime resident of Decatur, passed away Saturday (Jan. 19, 2002). Mr. Gallagher was born in Decatur. He was a decorated World War II Navy Veteran receiving the Purple Heart for serving his country. Surviving are his wife of 55 years, Norma Jean Gallagher; sons, Phillip Gallagher & wife Judy; Joseph Gallagher & wife Candice; Roy L. Gallagher; Michael Gallagher; Donald Gallagher; 10 grandchildren; seven great-grandchildren. William M. Schilling, 79, born July 10, 1923 in Walnut Hill, IL, passed away Saturday, Jan. 18, 2003, in his home with his wife and caregiver in attendance. "Bill" enlisted in the Army Air Corps in 1942, served as a radio operator-gunner and was stationed in Italy. He flew 51 missions in a B-17 over Germany in 6 months, receiving the Purple Heart, Air Medal, 7 service stars, and 3 Oak Leaf Clusters. He transferred from the Decatur, IL Signal Depot to White Sands Missile Range in 1956 and eventually became Supervisor at the Creative Engineering Shop (ASL). He and his family resided in El Paso, TX. After 30 years of Federal Service, he retired in 1977. He was an active parishioner of Blessed Sacrament and Most Holy Trinity churches, and a member of the American Legion and VFW. He is survived by Jeanne Schilling, his wife of 57 years, and 6 children: Morna Fontaine, Cheryl Metz, William D. Schilling, Michael Schilling, Mary Williamson, and Susie Kurth, plus a multitude of grandchildren and great-grandchildren. We extend our love and gratitude to Hospice of El Paso for their staff's TLC shared with Bill and our entire family. Visitation will be held at Kaster-Maxon & Futrell Funeral Home, 8817 Dyer St. on Wednesday, January 22nd from 5:00 p.m. to 9:00 p.m. Funeral Mass will be held at Most Holy Trinity Catholic Church on Thursday, January 23rd at 10:00 a.m. Burial will be held at Fort Bliss National Cemetery. In lieu of flowers, please send donations to Hospice of El Paso. SHELBYVILLE - Charles Leroy Alday, 72, Shelbyville, Army Corps of Engineers employee, died Saturday (May 31, 2003). Graveside memorial services: 11 a.m. Saturday, Glenwood Cemetery, Shelbyville, with military Rites. Arrangements by: Lockart and Sons Funeral Home, Shelbyville. DECATUR -- Joseph Gene Black, 73, of Decatur died 8 a.m. Wednesday (Dec. 24, 2003) in St. Mary's Hospital. Services will be 6 p.m. Sunday in St. John's Episcopal Church with visitation one hour before services. Burial will be 10 a.m. Monday in Mount Zion Cemetery. Dawson & Wikoff West Wood Street Funeral Home is in charge of arrangements. Memorials: St. John's Episcopal Church. Mr. Black was born Feb. 28, 1930, in Decatur, the son of John C. and Mabel W. Forbes Black. He was a traffic manager for Norfolk Southern railroad. He was a member of St. John's Episcopal Church and Stephen Decatur Masonic Lodge 979. He was a Navy veteran of the Korean War. He loved his animals, music and singing. He married Mary Phillips on June 10, 1982. Surviving are his wife; daughters, Jeanne Spears and husband Gary of Oreana; Susan Hayes and husband Larry, Martha Koshinski and husband Michael and Mary Needham and husband Steve, all of Decatur; stepson, Eric Davis and wife Carol of Bridgeport, Ind. ; stepdaughter, Cindy Kirk and husband David of Chandler, Ariz.; grandchildren, Michelle, Melody, Melissa, Stephen, Megan, Benjamin, Nicholas, Philip, Jaime, James and Courtney; many other loving family members. He was preceded in death by his parents, two brothers and two sisters. DECATUR -- Larry A. Schilling, 63, of Costa Rica, formerly of Decatur, passed away Thursday (March 11, 2004). Graveside services will be noon Friday in Lakewood Cemetery, Minneapolis, Minn. Visitation will be 5 to 8 p.m. Thursday in Washburn-McReavy Funeral Home, Hopkins, Minn. Flowers preferred in lieu of memorials. Larry grew up in Decatur, where he had many fond memories. He was a retired United Parcel Service driver. Surviving are his brother, Fred (Sheila); children, Jim (Chanel), Tom (Pam) and Susan (Jeff) Wigen; grandchildren, James, Whitney, Rowan and Wyatt; several nieces and nephews; many special friends, including Roy and Nancy Leming. He was truly one of a kind and will be missed by all that knew him. SHELBYVILLE -- Jennie Whiteside, 95, of Shelbyville died Saturday (Feb. 28, 2004) in Olivewood Healthcare in Shelbyville. Services will be 1 p.m. Wednesday in Moran & Goebel Funeral Home. Visitation will be one hour before services. Burial will be in Long Point Cemetery, Niantic. Memorials: Olivewood Healthcare, Shelbyville. Condolences to the family: www.moranandgoebel.com. Jennie was born May 15, 1908, in Amber, Okla., the daughter of William and Ethel Magee Burns. She was employed by the Holiday Inn at Wyckles Corner. She also worked as a housekeeper and companion to many elderly friends. She was a member of Berea Christian Church in Niantic. She married John H. Whiteside on July 25, 1925, in Decatur. He preceded her in death May 29, 1973. Surviving are her daughter, Vickie (Joe) Housh of Findlay; grandson, Joe Housh of Danville, Ind. ; granddaughter, Lisa Allen of Virden; great-grandchildren Zak and Kylie Allen, both of Virden. She was preceded in death by her parents, husband, four sisters and three brothers. DECATUR - Glen J. F. "Jim" Buckley, 70, of Springfield, Mass., passed away peacefully Saturday (Feb. 5, 2005) in Baystate Medical Center, Springfield. Services will be noon Wednesday in Bethany Assembly of God, Agawam, Mass., with visitation two hours before services in the church. Burial with committal services will follow in Massachusetts Veterans' Memorial Cemetery Committal Chapel, Agawam, with military rites. Colonial Forastiere Funeral Home, Agawam, is in charge of arrangements. Memorials: Bethany Assembly of God, 580 Main St., Agawam, MA 01001. Glen was born Nov. 17, 1934, in Decatur, the son of Henry S. and Lelah Beals Buckley. He graduated from the Decatur schools. He served his country in the Air Force during the Korean War and attained the rank of airman second class. He received the National Defense Service Medal. He had lived in Holyoke, Mass., upon completion of his military service and moved to Springfield in 1995. Glen had established a Christian home for boys at his home and was a foster parent to many children. He was a member of Bethany Assembly of God. He was employed as a crew leader and machine operator at the former Worthington Pump Co., now Atlas Copco, Holyoke. Most recently, Glen was employed at Sherwin-Williams Paint Co., West Springfield. Surviving are his wife, Kaye S. Theocles-Buckley; children, Glen Buckley Jr. of Missouri; Gayle Bajor of South Hadley, Mass. ; Deborah Buckley of Northampton, Mass. ; grandchildren, Todd Bajor of West Springfield; Nathan, Benjamin and Heather Buckley, all of Missouri; brothers and sisters, Jackie (Patricia) Buckley, Gene (Elizabeth) Buckley, Jerry (Marge) Buckley and Richard Buckley, all of Decatur; Marie (Richard) Best of Sumner, Wash.; Vera (A. E.) Christianson of Puyallup, Wash.; Walter (Barbara) Buckley of Mattoon; Johny (Dottie) Buckley of Tioga, La. ; stepbrother, Klaus (Elaine) Theiss of Pineville, La. He was preceded in death by his parents and brother, Clifford Donald Buckley. Glen will be dearly missed by all of his family and friends and will sadly be missed by his biscon, Taffie Lee. Published in the Decatur Herald & Review on 2/9/2005. DECATUR - Erma Eileen Bledsaw, 81, of Decatur, died 8:35 a.m. (Dec. 3, 2005) in her home. Visitation will be Tuesday, Dec. 6th, from 6 to 8 p.m. in First Christian Church, 3350 N. MacArthur Rd., Decatur. Funeral Service will be Wednesday, December 7th 10 a.m., First Christian Church with the Rev. Wayne Kent, officiating. Burial will be in Union Cemetery near Oreana. Memorials to First Christian Church. Tanzyus - Logan Funeral Service, is in charge of arrangements. Erma was born July, 1924 in Oreana, the daughter of Ira E. and Myrtle Likins, Babcock. She was a homemaker and an active member of First Christian Church and the Friendly Bible Class. Surviving are her husband, Don, son Rodney Bledsaw and wife Wanda of Sachse, TX; daughters Donna Parks and husband Rogers, of Moweaqua, IL Linda Kirby of Decatur and Rebecca Smith of Moweaqua, IL. Seven grandchildren and Ten great-grandchildren. She was preceded in death by her members. Online guest book at . DECATUR - Dorothy Leona Ellrick, 87, of Decatur, IL passed away at 12:45 A.M. on Thursday, December 15, 2005 in McKinley Court Nursing Home. Funeral services will be held at 11:00 A.M. Monday, Dec. 19, 2005 at Dawson & Wikoff West Wood Street Funeral Home, Decatur, with visitation one hour before service at the funeral home. Burial will be in Mt. Zion Cemetery, Mt. Zion, IL. Memorials may be directed to Foursquare Church, Decatur, IL. Mrs. Ellrick was born on January 6, 1918 in St. Louis, MO, the daughter of John William and Lillie Belle (Humes) Rutledge. She was retired from Adolph Meyer Zone Center, where she was an Assistant Cook. She was a member of Foursquare Gospel Church in Decatur and was one of the founding members of ASFCME Local Union in Decatur. She married John L. Ellrick on August 19, 1935. He preceded her in death on February 27, 1996. Surviving are: two sons, Gerald Ellrick and wife Rose Marie and Donald Ellrick and wife Judy, all of Clinton, IL; one daughter, Norma Ellrick of Latham, IL; daughter-in-law, Beverly Ellrick of Decatur; nine grandchildren; twenty-three great grandchildren and one great great grandchild. She was preceded in death by her parents, her husband John, one son Ronald, three brothers, three sisters and one granddaughter. Messages of condolence may be directed to the family via email at www.dawson-wikoff.com. Obituary written by family members. Published in the Decatur Herald & Review on 12/17/2005. DECATUR - Roger Eugene Burns, 62, of Decatur, passed away 9:44 A.M., Monday, December 26, 2005 at St. Mary's Hospital. Funeral services will be 10:00 A.M., Friday, December 30, at Brintlinger and Earl Funeral Home, Decatur. Visitation will be 6:00 to 8:00 P.M., Thursday, December 29 at the funeral home. Burial will be in Macon County Memorial Park, Harristown, IL. Memorials may be made to American Cancer Society. Mr. Burns was born September 25, 1943 in Pekin, IL, the son of Archer Dean and Geneva (Bertsch) Burns. He was an inspector for Exlon, retiring in 2004. Mr. Burns served in the United States Air Force. He was a member of Hidden Valley Church, and B.P.O.E. #401. He enjoyed golf, fishing and sports. Surviving are the mother of his children, Lyn Burns, son Kenneth Burns and wife Marcia, daughter Tammy Taylor and husband Leon, all of Decatur. Also surviving are his fiancee` Jean Reid and her child Craig Perkins and wife Brenda of Chatham, IL, grandchildren Kyle Burns, Bernadette and Rigina Wayne all of Decatur, Chad Taylor of Springfield, Heather Hartrich and husband Chad of Oreana, Haley and Hannah Perkins of Chatham, IL, great granddaughter Mariah Hartrich and sister Delores Clark and husband Gerald of Decatur. Obituary written by family members. MOWEAQUA - Donna Christine Parks, 62, of Moweaqua died 12:15 p.m. Friday (March 3, 2006) in St. Mary's Hospital. Services will be 10:30 a.m. Tuesday in First United Methodist Church, Moweaqua, with Pastor Sharon Treptow officiating. Visitation will be 4 to 8 p.m. Monday in Seitz Funeral Home, Moweaqua. Burial will be in Odd Fellows Cemetery, Moweaqua. Memorials: First United Methodist Church, Moweaqua Ambulance Service or Project Linus. Donna was born Feb. 16, 1944, in Decatur, the daughter of Don A. and Erma E. Babcock Bledsaw. She was a member of First United Methodist Church in Moweaqua. Donna was presently Moweaqua township supervisor and former township clerk. She gave many hours to charitable work for the Moweaqua Lions Club. She was a member of Project Linus Team 35 Blanketeer. She formerly worked for Burns Plumbing & Heating, T. A. Brinkoetter Plumbing Inc., Industrial Piping and Mechanical and was bookkeeper for Moweaqua Ambulance Service. She married Roger W. Parks on April 29, 1966, in Decatur. Surviving are her husband; son, Jeffrey and wife Jennifer of Moweaqua; daughter, Julie Ann Helm of Plano, Texas; father of Decatur; brother, Rodney Bledsaw and wife Wanda of Sachsem, Texas; sisters, Barbara Bickers and husband Bill of Champaign; Linda Kirby of Decatur; Becky Smith of Moweaqua; grandchildren, Tim Parks of Roseville, Calif.; Trevor Parks, Miles Neilson and Maggie Neilson, all of Moweaqua; Lauren Helm and Jared Helm, both of Plano; two nephews; three nieces; one very special grandniece, Abby. She was preceded in death by her mother and nephew, Bradley Kirby. Published in the Decatur Herald & Review from 3/4/2006 - 3/5/2006. MAYME LENA (ROBB) KELLEY DECATUR - Mayme Lena (Robb) Kelley, 91, of Decatur, IL, died Wednesday, January 3, 2007, at Decatur Memorial Hospital. Visitation will be 6 to 8 P.M., Sunday, January 7, at Brintlinger and Earl Funeral Home, Decatur, IL. Funeral services will be 10:00 A.M. Monday, January 8, at the funeral home, with visitation one hour prior to service time. Burial will be in Macon County Memorial Park, Harristown, IL. Memorials may be made to American Heart Association. Mayme was born November 14, 1915, in Decatur, IL, the daughter of Chester Earl and Lillian Mae (Demlo) Robb. She married Paul E. Kelley in 1942 in St. Louis, MO. He preceded her in death. Mayme worked part time as an Income Tax Consultant. She was a wonderful wife and mother and enjoyed crafts and doing hand craftwork. She also loved to travel. She is survived by her daughter Sheila Norene Schilling and husband Fred; sons Paul Eugene Kelley, Jr. and wife Nan, Kerry Alan Kelley and Kevin Jon Kelley, all of Decatur, IL; 8 grandchildren, 19 great grandchildren; sister Darlene Jones of Nampa, Idaho. She was preceded in death by her parents, husband Paul, daughter Bonnie, sister Helen, and brother Wayne. Obituary written by family members. DECATUR- James Donald Leavitt, Jr., 62 of Decatur, passed away at 10:17 am Monday, June 4, 2007 in St. John's Hospital, Springfield, with his wife at his side. Graveside service to celebrate James' life will be held at 10:30 am Friday in Graceland Cemetery, with Military Rites conducted by the Macon County Honor Guard. The "Flight Home" ceremony will conclude the services. Visitation will be held from 6 to 8 Thursday evening in the Graceland/ Fairlawn Funeral Home. Memorials are suggested to the American Heart Association or the American Diabetes Association. James was born on July 3, 1944 in Decatur, the son of James D. and Rosemary (Moore) Leavitt, Sr. He served in the U.S. Marine Corps from 1962 to 1969. Serving in Viet Nam twice. He worked for various industries and as an accountant for the State of Illinois from 1989 to the present time. He was a life member of the Veterans of Foreign Wars Post #99, life member of the American Legion Post #105 and a life member of the DAV Council #17 all of Decatur. He was also a life member of the National Rifle Association and the Illinois State Rifle Association. Surviving are his wife Judy, two aunts, Genevieve Moore of Decatur and Louise Thompson of Rochester, a special niece Tamra Gadberry and husband Mike of Meredosia, a special nephew, Darrin Weishaar of Beardstown, a special great niece Ashley Cooper of Rushville, a special great nephew Brock Cooper of Beardstown and other nieces and nephews. He was preceded in death by his parents and two brothers. Obituary written by family members. Source: Decatur Herald & Review, Decatur, Macon Co., Illinois. DECATUR - Don Arthur Bledsaw, 88 of Decatur died 2:30 p.m. Thursday (August 2, 2007) in his home. He left home to be with his Savior, family and friends. Funeral service will be 10:00 a.m. Monday at First Christian Church 3350 N. MacArthur Road Decatur, IL. 62526 with Pastor Tom Sager officiating. Visitation will be at the church 4 to 6 p.m. Sunday and one hour before the service. Burial will be in Union Cemetery Oreana, IL. Military Rites will be conducted by the Macon County Honor Guard. In lieu of flowers memorials may be made to the church Building Fund or Project Linus. Tanzyus-Logan Funeral Service is in charge of arrangements. Don was born March 24, 1919 in Decatur son of William & Ada Trueblood Bledsaw. He served in the Army during W.W.II from 1942-1945. He was a life member of American Legion Post 105. He worked as a construction mechanic for Christy-Foltz, Inc. for 30 years. He was a longtime member of First Christian Church. Don married Erma Babcock in 1942. Survivors include children, Linda Kirby of Mt. Zion, Rebecca Smith of Mt. Zion, Rod Bledsaw and wife Wanda of Sachse, Tx., Barbara Bickers and husband Bill of Champaign, IL., 11 grandchildren and many great grandchildren, brothers, Walt Bledsaw of Decatur, Jack Bledsaw of Chicago, sisters, Beulah Giles of Assumption, Eva Galloway and Vivian Bundy of Decatur. His parents, wife Erma, whom he dearly loved and cared for, brother Ralph, daughter Donna Parks and grandson Brad Kirby preceded him in death. As a life long member of our community Don was an example of loyalty, faithfulness, dependability and a willing servant to anyone in need. He serves as a shinning example to all the younger generations with a love of life and a strong desire to serve his fellowman. Dad was a treasure, and greatly loved by his family. A special thank you to all that cared for room 411 at St. Mary's Hospital, you were wonderful. Thank you St. John's Hospice for your gentle touch, and Dr. Addai for his excellent care. Obituary written by family members. Shirley Ann Calfas of Decatur, died Monday Sept. 20, 1999 In Oklahoma City, Ok, as a result of an automobile accident. Funeral Services will be held 12:00 noon Friday (9/24/1999) at Brintlinger's Funeral Home with visitation 5-8 P.M. on Thursday (9/23/1999) at Brintlinger's Funeral Home. Burial will be in Camp Butler National Cemetery in Riverton, IL. Memorials may be made to Wabash Memorial Hospital Assoc. or the Humane Society. Mrs. Calfas was born in Decatur, the daughter of Alva Bertrum & Bessie Marie (Akers) Ekiss. Mrs. Calfas had worked as a dental assistant/office manager for 30 years, working with Dr. Stone in Decatur, Dr. Campbell in Michigan, and later with Dr. Stiles in Decatur. She was a member of the Wabash Assoc..
She married Keith L. Stewart Sr. in 1947, then later married Jason George Calfas in 1968 in Peoria. Surviving are her children, Keith L. Stewart Jr. of Decatur, Cynthia A. (Stewart) Huber of Decatur, and Stepson George Michael Calfas of Decatur; Brother, Ronald Ekiss & wife Vivian of Decatur, Sisters; Beverly Dennis of Manhattan Beach, Ca., Gladys Runnals of Lake Elsinore, Ca., and Margaret Miller and husband Bob of Edmond, OK.; Grandchildren, Kelsey Huber, Chad Stewart, Shannon Atterbury & Step Grandson; Bradley Michael Calfas. She was preceded in death by her parents, husband Jason who also died as a result of the auto accident, 2 brothers; Carl and Charles and 1 sister; Lois. She will be deeply missed by her family and friends. WILLIAMS - Howard Williams, age 32 b. near Elwin. WOOD - Joseph Wood, d. June 18, ___?, age 44, b. St. Clair Co., Sept. 22, 1846, son of Robert Wood. Leaves wife and children. WHITE - Will White, age 27. PFIEFFER - Freddie Pfieffer, 8 yr. of age. NEWELL - Charles Newell, age 37, from Miami Co., Ohio. Md. Lizzie Godett - 3 children. MORRIS - Elva Morris, d. July 31, age 27, niece of Hiram. MORRIS - Cornelius Morris died age 82. Wife, 3 sons: Thomas, Elmer, George, 4 daughters: Mrs. Chester Frew, Mrs. E. W. Barkman, Mrs. Samuel Jameson, Mrs. Lenard Light. McGEE - Cleveland H. McGee, 5 yrs. Sept. 3, son of W. F. McGee. McDANIELS - Emanuel McDaniels, died at age 64 - Burial Salem Cemetery. Wife and 6 children survive: B. F., Mrs. Margaret Cooper, Albert, Mrs. Adelline Brown, Mrs. Alva Wilson, Dr. McDaniels. LEFEVER - Charley LeFever, age 24, June 22, son of Samuel Lefever. LORD - Mrs. Sarah Lord, wife of Thomas Lord. Mrs. Bertha Banfield, wife of William Banfield, died at 1: 15 Tuesday afternoon at the Ed Hill farm west of the city. Her death was caused by quick consumption. She was 23 years old and is survived by a husband and a baby daughter aged 4 months. The funeral will be held at 9 o'clock tomorrow morning from the family residence and the body will be taken to Tuscola for interment. Funeral services for Mrs. Ollie Myrtle Malcolm 1612 East Eldorado Street who died Monday will be conducted at 1pm Thursday in the Methodist Church at Walnut Hill, Illinois. Friends may call at the J. J. Moran & Sons funeral home in Decatur. Mrs. Bertha Banfield, wife of William Banfield, died at 1:15 Tuesday afternoon at the Ed Hill farm west of the city. Her death was caused by quick consumption. She was 23 years old and is survived by a husband and a baby daughter aged 4 months. The funeral will be held at 9 o'clock tomorrow morning from the family residence and the body will be taken to Tuscola for interment. Thermon LeRoy Buckley 44, of 380 W. Imboden Dr. died 11 am Saturday in Decatur Memorial Hospital in Decatur, Il. Funeral services will be 2 pm. Tuesday in Christ Lutheran Church, Decatur. Visitation will be 5 to 9 pm Monday in the Dawson Wikoff Funeral Home and from 1 pm. to service time Tuesday in the church. Burial will be in Graceland Cemetery on North Oakland in Decatur, Illinois. Pall bearers will be Wesley Hill, Steve Payton, Dale Thompson, Maurice Mannlien, Girard Durbin, and Jerry Sees. Memorials to Christ Lutheran Church and American Cancer Society. Mr. Buckley was born in Tower Hill, Il. a son Arthur and Alma A. (Stevens) Buckley. He was a member of Christ Lutheran Church, was a unit adjuster for Caterpillar Tractor Co., a U.S. Navy Veteran of the Korean Conflict and was active in the boy scouts. He was married to Edith Fields in 1955. Surviving are his wife; sons Robin Lee of Carbondale, Rick Scott at home; daughter Julie Ann at home, brothers; Art of Herrick, Bill of Mt. Zion; sisters, Mrs. Floyd (Helen) Curtis of Chicago; Mrs. Fred (Doris) Schilling of Mt. Zion, Mrs. Jess (Delores) Knotts of Decatur; Mrs. Walter (Rosemary) Ellrick and Mrs. Don (Elaine) Brozio all of Decatur, Il. A brother and sister preceded him in death. BERRY H. CASSELL was born in Dauphin County, PA, May 23, 1822. The family was of old German stock and moved from Virginia to Pennsylvania early in the settlement of that state. At the age of 17, Mr. Cassell came to Illinois and being impressed with the appearance of the country about Putnam county returned home and induced his parents to move to this state. The family started in the fall of 1839, going down the Ohio river from Pittsburg to Louisville. From the latter place they made the trip overland in two large wagons through an unbroken wilderness. Across the prairies of waving grass there was no trail to guide the travelers. The tall grass waved in front of them and on each side as far as the eye could reach. In the timber, however, they were able to follow a trail left by emigrants who had gone before. The party arrived in Decatur in November, 1839, and as the snow was deep they decided to remain here during the winter. In the spring all except Berry Cassell went on to Putnam county, but the latter decided to remain here. Decatur was then located in the center of thirty acres, the center of which was the old square. What is now Central park was then a timber and hazel brush patch and Mr. Cassell said, “It was the worst place for snakes in those days that I ever saw. I ran on to one big snake in there one day that caused me to run and it was the only snake I ever ran from”. In 1840, Mr. Cassell opened a tinner’s shop. He had a dollar and a quarter at that time and called on Captain Allen to go into partnership with him. Mr. Allen furnished the capital for the enterprise and a shop was opened on Franklin street in the cellar of a building close the intersection of Park and Franklin streets. The business prospered so that in the next spring the firm took the room on the first floor. In about a year Mr. Cassell bought a lot at the corner of South Park and Franklin streets and erected a small building to be used as his shop. Shortly afterward he sold the lot and moved the building to the lot at the corner of Water and East Main streets, no occupied by Linn & Scruggs. In the fall of 1852, he sold the Linn & Scruggs corner, 80 x 150 feet for $800. About that time Mr. Cassell started in business with William Prather, opening a hardware and furniture store in the Cantral building on East main street. In about a year the firm was compelled to seek larger quarters and moved to a building on the spot where the Morehouse & Wells Co. building now stands. At that time there was a great immigration to this part of the state and business was flourishing. Most of the immigrants located on farms and there was an urgent demand for farming implements which the firm handled. Money came fast and the firm prospered. Macon county at that time embraced part of Christian. Platt and Moultrie and Decatur drew trade from forty miles around. In 1855, the firm sold out to J. R. Gorin. Mr. Cassell early began to buy land in the new country. In 1852, he purchased 240 acres of land, the first 160 acres beginning at what is now the intersection of Wood and Broadway streets and extending north to the Wabash railroad, thence east to Jasper street and south to Wood and west to Broadway. There was no railroad at that time and the Wabash later received its right of way from Mr. Cassell. Another piece of land was soon purchased lying southeast of the other and taking in that territory where the brickyards are located southeast of the city. For the first piece of land, Mr. Cassell paid $12.%) an acre. He has since sold forty-foot lots off of it at $1,000 each. In 1856, Mr. Cassell purchased the Herald house, which stood on the lot now occupied by the St. Nicholas hotel and conducted the hotel for several years, changing its name to the Cassell house. Since giving it up he has devoted his time to looking after his real estate. During the time he was in the Herald house he had an opportunity to become intimately acquainted with Lincoln and Douglas. That was in the period of the exciting political campaigns in which both the men were taking such an active part. They spoke in the vicinity many times and always topped at the Herald house, Mr. Cassell could relate many of the stories told by Lincoln, many of which are not found in books. I was in the Cassell house that the convention of the editors of the state was held in February, 1856, and named the date of the convention which was held a few months later in the city of Bloomington when the Republican party was formed. When the people of Decatur were especially anxious for the Illinois Central to build passenger station here, Mr. Cassell gave the company five acres of land for depot purposes. Mr. Cassell sold to Henry Prather and William Martin thirty acres of land between Broadway and the railroad tracks and these two men with Mr. Cassell gave to the Wabash five acres of land for depot purposes. It was stipulated that a station should be erected but the Wabash did not build and a lawsuit to recover the property followed. There was a compromise and Mr. Cassell got back land where part of the buildings on Front street now stand and the Wabash got the land where the station is now located. Mr. Cassell served as clerk of Decatur in 1850, as clerk and treasurer in 1851, and clerk until 1855 when the city was incorporated. He also served as assessor several times. He was the last recorder of Macon county. He was elected in 1846 and in 1848 the officer of recorder was merged into that of circuit clerk. The education he acquired was picked up after the time he began to work. He was a fine penman and says he learned to write by scratching the letters on tin with a scratch awl and in that way learned to write a good hand. Although having attended school but a short time he managed to obtain a good education. he was an extensive reader and was well informed on many subjects. in his earlier days Mr. Cassell was very fold of music and spent much of his spare time in that way. He played a clarinet in the first band of which Decatur ever boasted and also played several other musical instruments. He had a wonderful memory for dates and events and could GE a clear description of the location of every building of what is known as the original town of Decatur. His close association with the business of the city and the active part he took in its growth probably made his recollection more distinct than most of the older settlers. During recent years, Mr. Cassell’s eyesight had been affected and he did not go about much. His beautiful home on Cassell’s Hill was erected in 1887 and contains twenty-two rooms. The hill is twelve feet higher than the pavement on Lincoln square and fifty feet higher than the pavement at the corner of East Prairie and Broadway. It is only a few feet less in elevation than John’s Hill. The house is reached by a private approach that would be Webster street if that were extended. The interior of the house is finished in hard wood cut on Cassell’s Hill and seasoned and specially prepared for this purpose. The grounds about the building are platted in a circle and contain about four acres. Outside the circle and immediately surrounding it on the east and north are about fourteen acres of land retained by Mr. Cassell until his death. Governor Oglesby made his first public speech on the spot where the house now stands. It was on July 4th, 1842, when a big celebration took place. The platform stood on the grounds now covered by the west and of the front porch and from this form Mr. Oglesby made an old fashioned Fourth of July oration and Henry Elliott read the Declaration of Independence.